Moto G6 gets you high-end specs at a reasonable price. Motorola is among the few smartphone makers that actively pushes the mid-range smartphone market. With its G series, the company has been trying to provide customers the taste of high-end devices at the affordable rate. Initially launched in 2013 the Motorola G series has only gone up considering the sales and performance. The mid range series comes with some high-end features that most of the company’s offers in exchange for a fortune. Besides, the Motorola G series smartphones have always been the top performer in the mid-range smartphone market. Now, Motorola has launched the latest upgrade of the series, Moto G6. The new G series update comes with many new features that only flagship smartphone offers. Motorola Moto G6 incorporates 18:6 aspect ratio but that isn't the only offering that makes this Motor G6 one of the best affordable 2018 smartphones. Motorola is giving dual-sensor rear camera along with fast charging, upgraded chipset and much more. Motorola Moto G6 is the best upgrade from the company in its G series that comes with some alluring design tweaks. The phone has given 18:9 aspect ratio that stretches the display of the phone to 5.7 without enlarging the shell. Motorola has shredded the bezel to acquire the higher aspect ratio that makes the phone look better than G5s launched in 2017. The back of the phone is built with 3D Glass that adds an additional shine and makes it prone to marks & scratches. Motorola has rounded the rear edges of the phone which make it more comfortable than its predecessor while holding in hand. Besides, there is an aluminum frame on which the phone’s body rests. The fingerprint sensor stayed at the front but smaller in size, which is still comfortable and easy to use. At the back of the phone, there is circular dual lens camera accompanied by a dual flashlight. At the bottom of the phone you will find a USB-C type at the center, and thankfully the 3.5mm jack is intact in Moto G6. The upgraded smartphone sport a 5.7 inch IPS LCD capacitive touchscreen that is packed with 1080 X 2160 pixels resolution. The display of the phone covers a wide area at the front that makes 75.4% screen to body ratio. The display of the phone is protected by Corning Gorilla Glass 3. The display offers Full HD+ resolution which means you will be getting a high-quality visual experience. However, the display isn’t much impressive compared to the flagship smartphones but it is considerable if you look at the price of the phone. Moto G6 comes with Qualcomm SDM450 Snapdragon 450 chipset which is a powerful hardware support for a mid-range smartphone. The chipset of the phone is paired with Octa-core (1.8 GHz Cortex-A53) processor that boost the processing power of the phone. The processing unit is accompanied by 3/4GB RAM and 32/64GB internal storage. The chipset upgrade is a significant move that makes Moto G6 faster and smarter than Moto G5s. We have tested the Motorola Moto G6 with 6GB RAM and 64GB internal storage for one week. I experienced the difference in processing speed while operating the heavy apps, and there was no lag while switching between the apps. The smartphone runs faster than all the models of G series launched in the past and works without any issue. The rear camera of the phone has become more stable and robust. With Motorola Moto G6 you will be getting a 12MP + 5MP rear camera that comes with phase detection autofocus, and dual-LED dual-tone flash. The camera offers all the essential camera features including Geo-tagging, touch focus, face detection, panorama, and auto-HDR. The 5MP lens act as the secondary sensor that is used for depth sensing in portrait mode. The camera is powerful enough to take high-quality images and the dual lens helps in capturing the photos with bokeh effect. During the review, we have taken many pictures via Motorola Moto G6 camera and it didn't disappoint us. Obviously, we can't expect it give us the Samsung Galaxy Note 8 or iPhone X like sharp results, but it manages to outrun all the competitions in the same price range. The front camera of the phone comes with an 8MP sensor that takes sharp selfies. Motorola Moto G6 uses Android 8.0 (Oreo) as its operating system right out of the box. The company will be pushing Android 8.1 update for both Moto G6 and G5S Plus soon. Motorola hasn't changed the battery, it comprised the same 3000mAh Li-Ion non-removable battery. However, the battery performance has improved it runs two to three hours more than its predecessors on the similar usage. 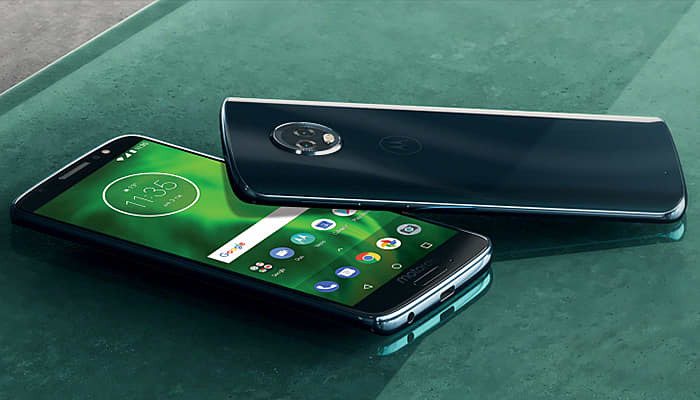 Motorola launched Moto G6 first in Brazil on April 19, 2018, and Motorola announced the phone during a press conference. Later, the phone was launched in the UK, US, and India in May. Motorola Moto G6 costs cost £219 / $249, for the standard version containing 3GB RAM and 32GB internal storage. For the variant with 4GB RAM and 64GB internal storage, you need to spend £239. Motorola has never disappointed us with its G series smartphones, and this time the story remains the same. Moto G6 is a good option if you're looking for a budget smartphone with all features packed in a good design. The phone's performance is excellent, and it is capable of operating the heavy apps and run high-resolution games smoothly. Motorola Moto G6 camera is perfect and worth the price as it takes excellent images. We liked the latest upgrade from Motorola. However, the review of Moto G6 Plus is still pending from our side. We will be posting the latest Motorola Moto G6 Plus review soon to let you know the best choice among these two new editions from Motorola.